Andy Symons' delight at being part of the current Saints set-up has been there for all to see in recent weeks. Seconds after walking off the pitch in the Wanderers' win at Leicester Tigers, the centre was speaking of how 'awesome' it is to sport the Northampton badge. And this week, following his second appearance off the Saints bench in as many weeks, Symons was discussing how he has found life at Franklin's Gardens. "I've really enjoyed it so far," said the 27-year-old, who switched to Northampton from Gloucester during the summer. "There have obviously been quite a few changes at the top and it's been great to mix the environment up and I'm enjoying my rugby again. "I was talking to Saints for a while but I wasn't really planning on moving but it forced my hand a little bit, this opportunity came up and I couldn't turn it down. "I was happy at Gloucester, it was just about opportunities and I just want to play as much rugby as I can. "It's not always up to you - some coaches come in and want to bring their own players in and that's completely understandable. "It just didn't work out for me at Gloucester." Symons also counts Worcester Warriors, Leicester Tigers, Doncaster Knights and Tasman Makos among his former clubs. But he said: "At every club I've been to, I've wanted to settle down. "But you sign with one coach and another one comes in so hopefully this is me for the long term. "It's a great set-up here, I'm really learning a lot and it does have a real buzz about it. 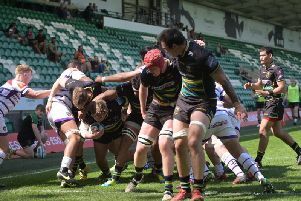 "I couldn't believe how friendly the fans are and having played here at the Gardens before, when the chant of 'oh when the Saints go marching in' rings around it's a good feeling. "I'm really lucky to be at a big club like this and hopefully I can take my opportunities. "It's just about game time because after an injury you're going to be rusty but I'm getting chances and hopefully I can build some form." The quietly-spoken Symons didn't have the easiest start to life at Saints, having picked up a pectoral injury in Gloucester's Challenge Cup final defeat to Cardiff Blues in Bilbao back in May. "It was an injury I was working away at behind the scenes while the boys were slogging away in pre-season," explained Symons. "I was just doing what I needed to do to get back in time and it's great to be back fit. "It's really tough when you arrive and people are like 'who's this bloke who has just arrived and has locked himself away and is grafting on his own?'. "A couple of the other boys had to do the same and there's no easy way of doing it so you've just got to get your head down and do what you need to do." Symons is competing with the likes of Luther Burrell, Nafi Tuitavake and Andrew Kellaway for the Saints 13 shirt this season. And the Harlow-born back said: "It's fierce and that's what you need. "You don't want to be somewhere comfortable where you're playing a lot of rugby and not getting pushed. "To get into that top form, you need to be training every day and challenging the players around you and yourself." Symons is set to face Bath at The Rec this Saturday. And he can't wait to get out on the field in a Saints shirt once again. "I enjoy playing at The Rec, apart from the changing room," he said. "It's a great place to go and play because they are mad keen on their rugby in Bath. "It's going to be awesome to go and play there. "I'm 100 per cent looking forward to playing and I don't care where we play. "Just getting out with the boys is something that really excites me."